Jamal Khashoggi's Fiancee Calls For Saudis To Return His Body At Memorial In D.C. Jamal Khashoggi's fiancée, Hatice Cengiz, was the main speaker at the memorial, which ended with a prayer for the slain Washington Post columnist. Jamal Khashoggi's fiancee and others will speak about his life and legacy on Friday, one month after he was killed in Saudi Arabia's consulate in Istanbul. Here, a protester holds a placard showing solidarity for Khashoggi during a demonstration outside the Saudi Arabian Embassy in London last week. Slain journalist Jamal Khashoggi was killed as he tried to arrange paperwork for his wedding — and his fiancée, Hatice Cengiz, says it's been impossible for her to cope with his death, because of the events that began with Khashoggi dying at Saudi Arabia's consulate in Istanbul. "I really don't know how to express myself," Cengiz said at a memorial in Washington, D.C., Friday. "Nothing has relieved me of the pain from the atrocity I experienced. The most important reason for this is because his corpse has still not been found." Without his body, Khashoggi's loved ones haven't been able to perform his funeral prayer, Cengiz said, adding, "our pain is still as fresh as the first day." Cengiz spoke in a recorded video message that was played at the event at the Mayflower Hotel, one month after Khashoggi was killed. He was a columnist for The Washington Post — which streamed video of today's memorial. The whereabouts of Khashoggi's remains are unknown, and the U.S., Turkey, and other nations have called for Saudi Arabia to fully cooperate in a transparent investigation into his death. 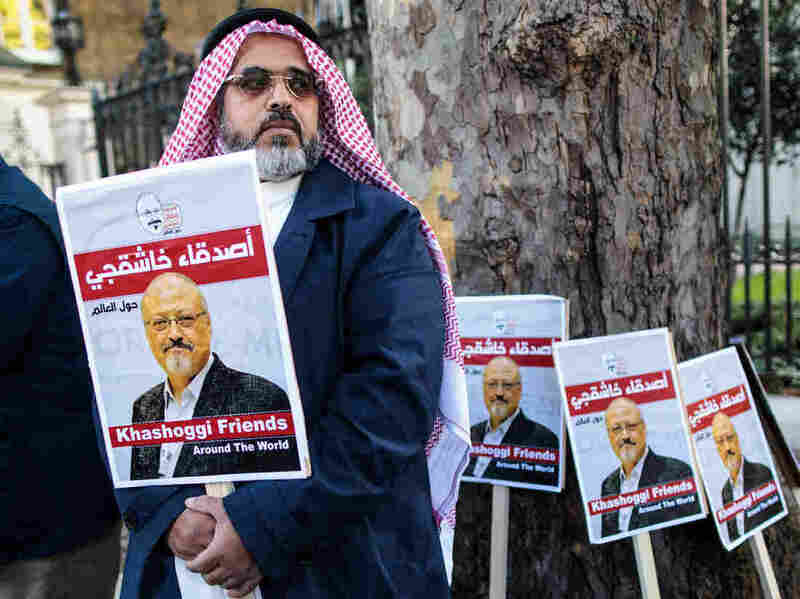 The memorial was organized by the Justice for Jamal Khashoggi campaign. It concluded with a prayer — the salat al-ghaib, which is performed in memory of "Muslims who have died in a distant place," according to the event's program. Hours before the memorial, Cengiz wrote about Khashoggi in an opinion piece for The Washington Post, saying, "As we witness the international outrage at his killing, the perpetrators should know that they can never erase his vision for his beloved country. They have only emboldened it." She added, "It is now up to the international community to bring the perpetrators to justice." Turkish President Recep Tayyip Erdogan has said Khashoggi was "brutally murdered" in a Saudi operation that involved more than a dozen men. Scrutiny and suspicion have fallen on Saudi Crown Prince Mohammed bin Salman, who is known for taking direct measures against those who oppose him. Saudi officials have offered varying explanations for how and why Khashoggi was killed on Oct. 2. First came the insistence that the country had nothing to do with the disappearance of one of its high-profile critics. Claims that Khashoggi had died in a fight followed — and last week, a Saudi prosecutor said the killing was premeditated. Providing new details about Khashoggi's death this week, the Istanbul Prosecutor's Office called it an "assassination," issuing a statement saying Khashoggi was set upon soon after he entered the consulate, as part of a plan. "His body was disposed of after being dismembered following his death by suffocation — again, in line with the plans," the statement said, according to Turkey's state-run Anadalou Agency. In addition to marking one month since Khashoggi's death, today is also the International Day to End Impunity for Crimes against Journalists, as declared by the U.N.
"On this day, I pay tribute to journalists who do their jobs every day despite intimidation and threats. Their work – and that of their fallen colleagues — reminds us that truth never dies. Neither must our commitment to the fundamental right to freedom of expression. "Reporting is not a crime." The Nov. 2 date was chosen to remember two French journalists who were killed in Mali on this day in 2013 — two of the more than 1,000 journalists whom the U.N. says have died since 2006.